These classes introduce traditional instruments to students and participants. 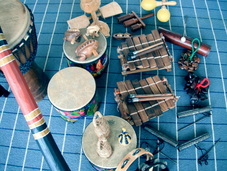 Instruments include: Balafon, djembe, didjeridu, casa casa, caxixi, bells, tamborine, wood frogs, togo seed shakers and many more. We learn the basics and have facilitated and spontaneous music jams. Children and adults alike find the rhythm inside. With music comes DANCE! Following Mother Natures lead we dance the elements to music that inspires those qualities. This camp focuses on the creation of the ancient instrument from Australia and the instruction necessary to learn to play it. As you connect to the natural world around you, inspiration will take hold as you paint and create your "story". A sacred dance acknowledges the transformation and you will be introduced to a world of music - making new yet from a very primal and ancient origin. We will learn deep breathing, rhythmic breathing, circular breathing, animal imitations, tongue patterns and the drone most recognized by many. To be continued We will be taking time off for the summer. BUT... Keep the Beat Groovin' no matter where you stand! This class introduces traditional ethnic instruments, original and classic songs and movement to parents and children. The intention here is to be active participants in creative self expression. To meet those edges found in ourselves that might prevent us from inspiring our children to STAY connected to the birth right of PLAY and EXPRESSION. 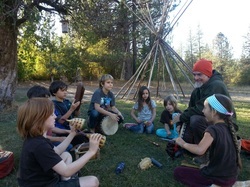 Inspired by indigenous communities, we will immerse ourselves in playing, moving and singing together. Instruments include: Balafon, djembe, didjeridu, casa casa, caxixi, bells, tamborine, wood frogs, togo seed shakers and many more. We learn the basics and have facilitated and spontaneous music jams. Children and adults alike find the rhythm inside themselves. With music comes DANCE! Following Mother Nature's lead, we dance the elements to music that inspires those qualities found in nature. Age appropriate: Infant to toddler with parent. With a deep respect for Aboriginal Australia and all indigenous cultures on this planet, I feel honored to share these modalities of connection, spirit and healing.